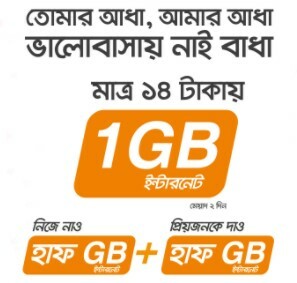 Banglalink Valentine’s Day Offer 2019 – 1GB@31TK & 2GB@42TK! Hello Dear, Welcome to Banglalink 1GB Internet 31 TK and 2GB Internet 42 TK Happy Valentine’s Day Offer 2019. The Bangladeshi 3rd Biggest and popular telecommunication company brings a super internet offer for celebrating 14th February, 2019 Happy Valentine’s Day, whose name is Banglalink Valentine’s Day 1GB 31 TK and 2GB 42 TK Internet Offer 2019. BL 1GB 31 TK with 3Days validity offer, just Recharge 31Tk or Dial *5000*31#. Banglalink 2GB 42 TK with 3days validity offer, Recharge 42Tk or Dial *5000*42#. To check remaining internet balance, dial *5000*500#. All the Banglalink Prepaid and CnC connection users are eligible to enjoy BL Valentine Day Offer 2019. Under this offer, customers get 1024 MB Internet at only 14 Taka. But, the subscriber use only 512MB and he/she must need to gift Friend/Family Member other 512MB Internet. If you want to enjoy BL Valentine’s Day Campaign 2019, first check its detail information from below. To activate the BL 1GB @ 14 TK Happy Valentines Day Offer 2019, Customers need to Dial USSD Code *5000*1414#. After Dialing this USSD Code, customers get 512MB Internet instantly on main internet balance. After subscription of the BL 1GB 14 TK Valentine’s Day pack, the subscriber will be able to gift 512MB bonus by writing VF<space>Friend’s BL number and sending it to 2500. Within 24hrs, 512MB bonus will be posted to the referred MSISDN with a validity of 2 days. The maximum time to refer someone is within the same calendar day of pack subscription. One Customers can refer only one person once for the referred bonus against his/her data pack subscription each time. The Subscriber can refer him/herself also to get the referred data bonus. VAT + SD + SC included in recharge amount 14 Taka. The Validity of Banglalink Valentines Day 2018 Internet Offer 2 days and validity starts from offer activation day. Hello Dear, Welcome to Banglalink Valentines Day Offer 2017 Internet 499 MB @ 49 TK & 1.5GB @ 99 TK. 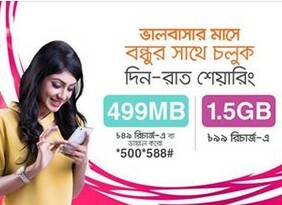 All the Banglalink Prepaid and Postpaid connection users are eligible to buy BL Valentines Day Offer 2017 Internet 499 MB @ 49 TK & 1.5GB @ 99 TK Offer. If you are a Banglalink Customers and Searching Banglalink Valentines Day 2017 Offer, We recommend you first check the Banglalink Valentines Day Offer 2017 Internet 499 MB @ 49 TK & 1.5GB @ 99 TK Details Informations. To activate Banglalink Valentines Day 499 MB @ 49 TK Offer, Customers need to Dial USSD Code *5000*588# or recharge exact 49 TK and Banglalink Valentines Day 1.5 GB @ 99 TK Offer, Customers need to Recharge 99 TK. The validity of Banglalink Valentines Day 2017 Offer 499 MB internet 49 TK 5 days and 1.5GB internet (1 GB Regular + 500 MB Facebook) @ 99 TK Recharge Offer 7 days. This BL Valentines Day 2017 Internet Offer runs until further notice. Customers can use this Banglalink Valentines Day Internet Offer 2017 both 2G/3G area Networks and uses time 24 hours. Thanks for staying with us a long time and visiting Banglalink Valentines Day Offer 2019 article. If you have any confusion or question about the Banglalink Valentines Day Offer 2019, Just comment here. We reply as soon as possible with a correct answer.